By Paul LaViolette | January 23, 2019 - 7:47 pm | April 6, 2019 Astronomy, News! Measurements at microwave wavelengths of Sgr A*, which is popularly called a “black hole”, indicate that its radiation comes from a region smaller than its event horizon. This proves that it cannot be a black hole since these measurements show it to be luminous rather than black. The event horizon for Sgr A* is estimated to have a Schwarzschild radius equal to 0.08 AU which is gravitationally lensed up to a size of 0.42 AU, or about the radius of Mercury’s orbit. 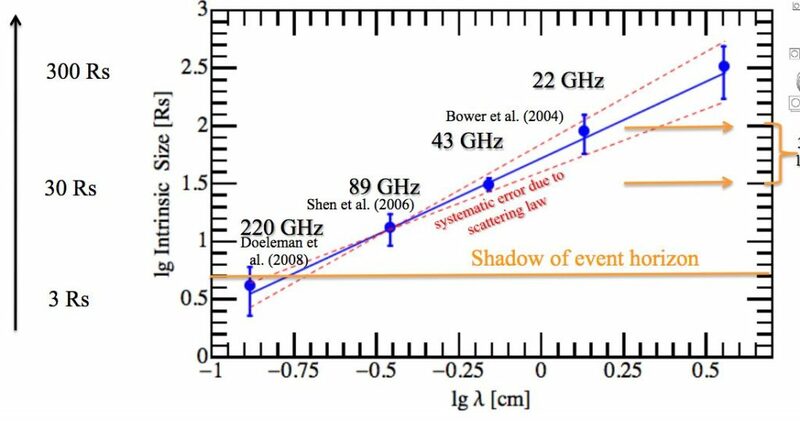 The graph below, prepared by H. Falcke, indicates the size of Sgr A* as observed at increasingly short wavelengths. The best estimate of size currently is the observation at 220 GHz, since measurements at higher frequencies do not give an accurate size. As seen in the graph, the radius of the Galactic core is shown to be only 0.6 gravitationally lensed Schwarzschild radii (Rs) at this observation frequency. So at 220 GHz the radius of Sgr A* has been determined to be less than 0.3 AU. Since this is radiation we are seeing and not blackness, these measurements apparently show that Sgr A* is not a black hole. Rather the results support the prediction of subquantum kinetics that Sgr A* is a mother star that continuously generates and expels matter and energy. Radius of Sgr A* as a function of wavelength. Radius is given in units of Schwarzchild radius. Astrophysicists hold on to their belief that Sgr A* is a black hole, claiming that the detected microwave emission is coming from gas positioned in front of Sgr A*. The problem though, is that this gas does not appear to be orbiting the core; see Broderick, et al., 2018, at the bottom of p. 12. Since all matter around Sgr A* necessarily orbits it at high velocity, this indicates that what we are seeing comes from the surface of Sgr A*. Hence because the core is radiating energy, it cannot be a black hole. When they have no other recourse, astrophysicists will probably refer to this as Hawking radiation. But in reality what they are seeing is a mother star, as conceived in subquantum kinetics. All this has been discussed before in the Starburst Superwave Forum. But the conclusions are the same. 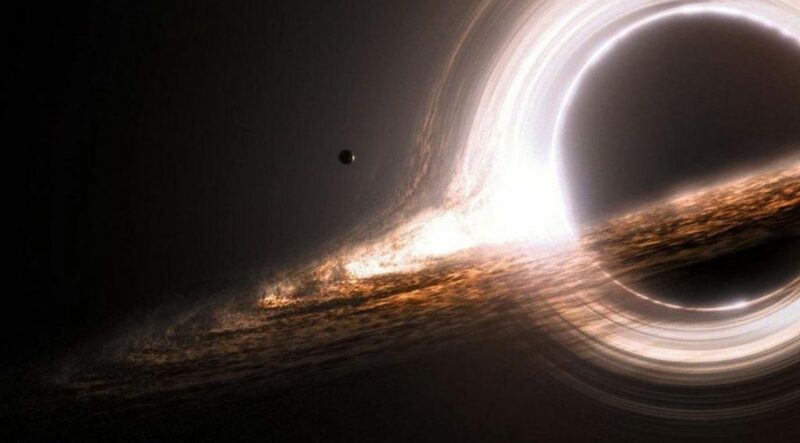 There are others who also believe that black holes do not exist, like physicists Albert Einstein, Phillip Morrison, Laura Mersini-Houghton, J-P Petit, and Stephen Hawking (partially). In the case of Hawking, in 2013 he announced that black holes can emit radiation, which physicists now call Hawking radiation. So what would you call this radiation coming from mother stars, LaViolette radiation? I doubt it, but when the GC goes active, such radiation would more appropriately be called a galactic superwave, and pretty shortly we are going to see it shining in all its glory. Here is further discussion of the subject of the non existence of black holes. One other important development that is in the news is the discovery that Sgr A* has a jet pointing directly towards us; also see Issaoun, 2019. In other words, the Galactic core is ejecting matter and energy towards us; i.e., there is an outflow directed towards us. This is essentially a confirmation of the superwave scenario, namely that supermassive galactic cores can spew out matter and energy, and at times at prodigious rates. But actually, what they are seeing is not a jet, but an isotropic outflow. From whatever direction the Galactic center is viewed, material will be seen coming towards the viewer. We cannot see the flow emitted in other directions since we are not aligned with it. The reason we don’t see columnated jets in the other directions is because the flow is isotropic and not bundled into jets. One other thing to consider is that the synchrotron emission coming from Sgr A* is circularly polarized. This indicates that the radiation is being produced by cosmic rays coming directly towards us. Again, this radiation will appear circularly polarized from whatever direction one views the Galactic center. More information on this is given in the following Starburst press release. How do you relate with the Electric Universe theory? They seem to go for a least amount of paradoxes/maximising simplicity approach. (No blackholes, imaginary particles, strings, genic energies or whatnot). Is there any correlation to the models or completely seperate? I have not taken the time to read all of their work so cannot comment. But you could do that. Read subquantum kinetics and their work and see where are the similarities. Maybe a comparison already exists on the internet. Nice confirmation of your theory. Btw, you and your theories have come up some in the Youtube channel, “Suspicious Observers” run by Ben Davidson. Ben is currently doing a series on ancient catastrophism and the evidence in the Earth and Moon for same. Two of the possible mechanisms discussed for certain evidence is something like a 12, 000 or so year cyclic Solar micronova and your theory of Galactic Core superwaves. Ben also organizes a semi-large annual conference down in New Mexico with various speakers in February. Normally he focuses most on Solar, astronomy and everyday scientific data and paradigms. This new series is somewhat a departure from the usual and primary focus. He leans to the electric-plasma physics side of the larger cosmos and highly questions the concept of dark matter. Also questions the mainstream’s version of global warming some (that it’s only caused by humans, etc). You might want to get in touch with him about possibly being a guest speaker in February 2020? Meanwhile, best of luck and hope the confirmations/validations keep on rolling in. I’m going to share this article’s page over there. Very informative. Thank you for publishing this well written and referenced report! (apologies if these are stupid questions) I have a few questions, can I couldn’t find the anwsers on internet. My question is the energy( simple version) also increasing or decreasing every year? Is it possible to find that out? And do you think certain days are more important with the energy/radiation is reaching earth because of allignments? Thank you very much! Yes this was not a good question. Nothing from what we are seeing is going to reach the Earth. This is the quiescent flux from Sgr A*. It has always been reaching us. So nothing to worry. Just worry about the superwave and that no one knows when it will come. Thank you anyway for the anwser. This does answer my own question. But it is possible to know when it comes, in my opinion. Just an odd question … do think this outburst could be in some way connected to the G2 cloud incident? I know it’s been a few years, but maybe the time and real distance are factors somehow? Something – was drawn in? Just wondering. Perhaps I did not explain clearly in the posting. They are not saying that this is an outburst or flare. In my opinion it is the normal energy flux from Sgr A* in its present quiescent state. Do you see anything to worry about in this scenario? Not healthwise. What I worry about is that, with all the evidence staring them in the face, they may not wake out of their black hole hypnotism.